In Geoff Johns’ Justice League #1 we saw that Hal and Barry knew each other and that they were effectively a two-man superhero team. It was a really interesting dynamic, especially given how natural their relationship was portrayed. What Buccellato has done with this issue is show how the two heroes first met and the consequences of that meeting. It made for a great change of pace from everything else that’s been happening in DC comics right now, lots of death and mayhem and darkness and grimgrimgrim and seriousness. A GREAT change of pace, and that has a LOT to do with the inherent nature of these two heroes. Even though both Hal and Barry are quite different from each other, in terms of what kind of heroes they are, they are also very similar. And a lot of that has to do with their attitudes. I’m a fan of Geoff Johns’ Hal Jordan, whether we are talking about his reboot of the character in Green Lantern: Rebirth or his 20-issue run on the character in the New 52, and Buccellato drew me into his version of Hal in a heartbeat. He doesn’t waste any time establishing who Hal is, what kind of a guy he is, and so on. He does it in quick couple of panels through dialogue and actions, no random exposition, if that makes sense. His Hal is the Hal that I’ve been reading about for more than a year now, the Hal that I enjoy and love. With Barry, I don’t know much about the character and he is effectively a blank slate for me (outside of Crisis on Infinite Earths), and I barely got to know him from the first three issues last year so its not exactly like I really can connect with him. But Buccellato got me to connect. It felt like I knew who this character was, and that was a great feeling. There was no feeling of alienation from the character at all. And best of all, the camaraderie between Barry and Hal is plain excellent. It is easy, it is relaxed, and it is full of good-natured banter. As if the two are long-time friends. This is how I kind of imagine the friendship between Superman and Batman to be, except, with a lot less subtle snark from Bruce and a lot less “boy scout” enthusiasm from Clark. I keep hearing, ever since this issue dropped, that there totally should be a The Flash/Green Lantern ongoing, written by Buccellato. Well, if DC does decide to do that, then I’m sure as hell going to be in on that one. Quite frankly, I would love for there to be more exposure to DC characters who are NOT Batman or Superman. And come on, the entire dynamic between Barry and Hal is a perfect setup for such a book. I hope that DC at least explores the idea. It would be good. I’d market the hell out of it if they do it. The backup story, by Nicole Dubuc, was quite an interesting tale in its own right. It deals with the classic superhero trope of “what if the hero can’t save everyone”? The way Dubuc treats the story was a bit odd, since she wrote it to be very… instructive and philosophical, and I’m not sure if that worked out well in the end, but I liked the concept of it. What’s weird is that after reading the annual I was doing some wikipedia info-download on Wally West and I came across a bit of a fact: the story that Dubuc tells here is pretty much the same story done a couple decades before with Wally. I’m not sure what DC is trying to do here, whether they want to retcon Wally out of his own stories or not, and this confused me. Dubuc’s story is certainly well-written, but this… revelation throws a spanner in the works, sort of. Regardless, what I will say is that this was definitely a great annual and that I look forward to many more from Buccellato and team. Speaking of the art, Sam Basri did the pencils and inks here while Stellar Labs did the colours and Taylor Esposito did the letters. I’ll say that Basri’s art is a huge reason why I loved this book so much. Like the heroes of the script, the pencils are plain fantastic. All clean lines, with characters who are expressive with both their faces and their body language, and who all have a consistent look from panel to panel with little to no deviation of any kind. And the colours fit the moods and attitudes of the heroes as well. Bold, bright, and soft. A perfect mix of talent here. The entire page where Barry gets the power ring from Hal, was a highlight especially. Both through the script and the art, it is conveyed just how Barry accesses the Speed Force and how having a power ring changes him. For the backup, Cully Hamner did the artwork, while Matthew Wilson did the colours and Carlos M. Mangual did the letters. Tonally, the backup is completely different, since it is much more rugged, hard-angled and full of shading. Not sure if I’m a fan of it all that much, but it was certainly good enough and Hamner and Wilson do leave their mark. In the final tally, I definitely recommend that you go and pick up this book. It is worth it, and now I’m going to go and pick up the issues for the current arc, as written by Buccellato. 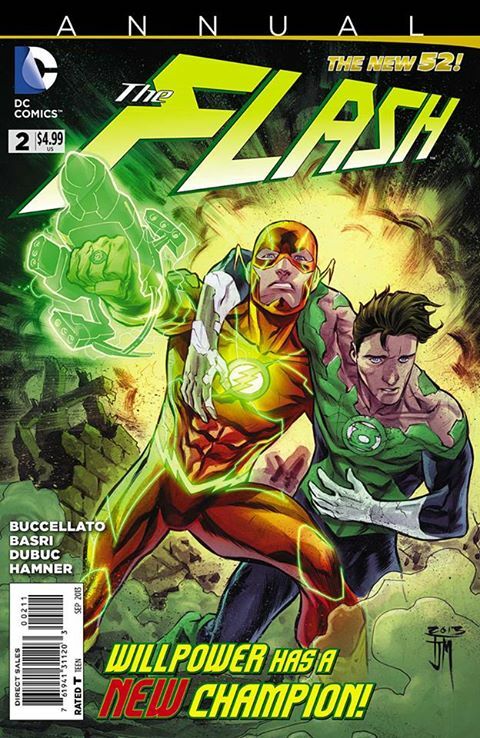 Posted on August 6, 2013, in 2013 Reading Challenge, Challenges, Comics Reviews, Review Central and tagged 2013 Reading Challenge, Barry Allen, Brian Buccellato, Challenges, Comics, Comics Reviews, Cully Hamner, Green Lantern, Hal Jordan, New 52, Review, Review Central, Sam Basri, The Flash. Bookmark the permalink. 11 Comments.